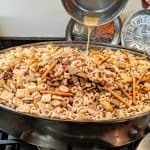 Combine Cheerios, Wheat Chex, Rice Chex, Pretzels, and Mixed Nuts in a large roasting pan. In a separate bowl, blend Beau Monde Seasoning with melted butter and peanut oil. Pour seasoning blend over dry mix and blend well with a large plastic spoon. Bake at 200 degrees F for 1 1/2 hours, mixing occasionally.